As part Anthology Recordings’ Surf Archive series, we celebrate the soundtracks to Andrew Kidman’s classic 1996 film Litmus alongside his 2006 follow up Glass Love. By the early ‘90s, surfing was on an upswing in popularity as professional surfers became marketable athletes. The three-fin, high performance, “thruster” shortboard was the tool of choice, lending to a fast-paced slashing style and ultimately a more aggressive “surf and destroy” movement in board culture. 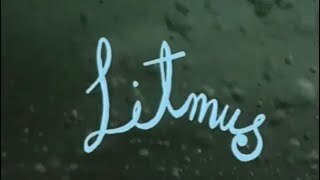 Litmus, Andrew Kidman’s first avant-garde surf film, served as a soulful reaction to the pop-punk progression that dominated the “alternative” mainstream. With the film’s visceral and cerebral moodiness, folksy soundtrack, and meditative spirit, critics swooned over surf misfits like Wayne Lynch, Derek Hynd, Tom Curren, and Joel Fitzgerald. Despite the acclaim, the film was not much of a commercial success at the time. The aura of Litmus’ soundtrack, however, has found its cultish corner in the surf world. Prior to filming Litmus, Kidman’s band, The Val Dusty Experiment, recorded a total of thirty-five songs in one day. The outcome of the “one-and-done” sessions was a lo-fi, rustic, experimental rock ‘n’ roll sound, adding a rough-around-the-edges ambiance to the surf scenes that span Ireland, Australia, California, and South Africa. Additional contributions from Yothu Yindi and The Screaming Orphans diversify the score. Litmus was a defining moment in surf filmmaking — it sparked an open-minded retro-progressive movement as surfers formed a higher consciousness about the types of boards they were riding and why. Kidman released his second film, Glass Love, ten years later. As with Litmus, the music came first; Kidman felt his songwriting was ready to take on a new life. Thanks in part to Litmus, experimentation in board design progressed as surfers became more contemplative, questioning, ‘is surfing art or sport?’ Glass Love and its soundtrack highlights this mindset and time period, creating an extra dimension to surfing that is still prevalent today. Andrew Kidman Litmus / Glass Love box set and 100% Cotton Pacific Tote Company tote bag. Includes Mexican Summer & Anthology Recordings felt patches.